Propertyology have assisted Lee and Linda purchase 3 properties in just over 18 months. Including their family home, they now own 4 properties, in 4 different locations (each with different economic industry drivers), across 3 different states. Unfortunately for the vendors of this particular property, when they purchased, only a couple of years ago, they fell into the trap that many DIY purchases do. They became emotional and over paid for the property. 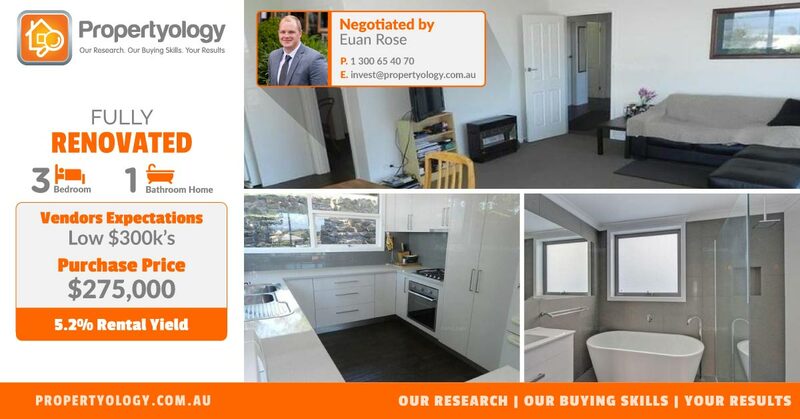 So much so, that in a market which has moved over 6% in the last couple of years, our Buyers Agent Euan Rose, was able to secure this fully renovated low maintenance home for less than what the vendors paid for it, and over $15,000 under the vendors expectations!! Lee and Linda are now the proud owners of a very diversified property portfolio! Even with settlement on this third purchase having been completed recently, Lee and Linda are already discussing options with their broker to obtain pre-approval for another property this year. Congratulations again on behalf of the entire team and we look forward to working closely with you again in the very near future Lee and Linda.